Hello world! Today’s column requires some homework before you proceed, and that is watching Charli XCX’s music video “Boys” (2017). Get a cozy bathrobe and all your friends, ‘cause this one’s syrupy. If you need to watch it more than once, that’s totally fine. Same. 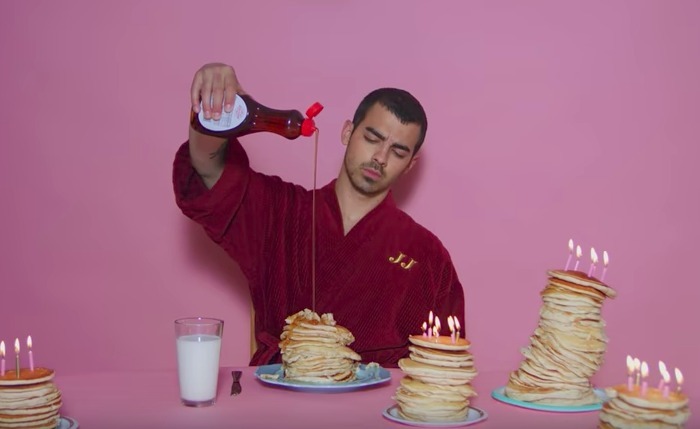 Joe Jonas: I was always a Nick type of girl, but man do we have some serious pancakes by the ocean here. Strong opening to the video and highlights the importance of eating breakfast. Charlie Puth: He’s covered in soap, sensually washing a car. After reading some of his Genius annotations, Charlie strikes me as, ahem, a little immature, so I enjoy when they throw a wet sponge at his face. Khalid: Why are the dogs purple. Dogs should not be purple. PETA would be horrified. It looks like he’s holding two sad Furbies. Charli also pokes fun at some classic macho scenes. We have Wiz Khalifa and Ty Dolla $ign raining Monopoly money with Charli’s face on it, Cameron Dallas slinging a chainsaw while literal sparks fly, G-Eazy trying to look tough with a motorcycle, and Jack Antonoff doing bicep curls. Swoon! There is also rose-eating, cake-smashing, and flamingo-pool-toy floating, just to add to the fantasy. D.R.A.M. takes a sledgehammer to some old TVs, and Khalid gets kissed by a few puppies. Actually, there are a lot of puppies. Perhaps an illusion to the Tinder-verse, where every single boy magically has a dog and wants you to know about it. I’m calling shenanigans. All in all, I would have given anything to have been at this video shoot. Alright guys, that’s it for this week. If you would like to share some music with me, throw it on my collaborative playlist!